Read sample poems from this book. 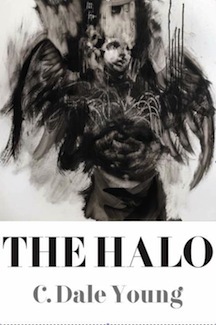 The Halo is quasi-autobiography about a man who has wings and wants desperately to simply be human. Tracking from adolescence through adulthood, it explores an accident that temporarily paralyzes him and exposes him to human weakness all the way to his transformation into something more powerful than even he realizes. It explores a personal evolution from being prey to becoming the hunter. "[The Halo] is obsessed with precision, or perhaps more accurately, human inability to be precise. Despite the vast cultural archives from which Young draws, the book never once wavers from precise five-line stanzas. He adheres to his own lines, that poems are '…those / intricate machines of delicacy and controlled measures.' Poetry is both mechanical and imaginative, intentional and uncontrollable." "Young's poems are so fierce and serrated." "Young is a doctor as well as a poet, and [his poetry] demonstrates a skilled physician’s combination of empathy and formal precision.” "
"Like medicine, poetry may demand that we treat wounds, that we understand mortality, that we apply all possible skill to the often messy terrain of human life. But poetry can also demand that we not repair, that we leave torn what is torn. This is Young’s great gift. He balances his desire to treat his subjects exquisitely and assiduously with his healthy skepticism about easy resolutions." "The thrill of Young's work (paradoxically) is that it takes place in slow motion. The collision is set in motion early in the poem, and inexorably, the impact approaches. The endings of his poems are devastating precisely because they have been coming for so long. He makes us wait, but always delivers."